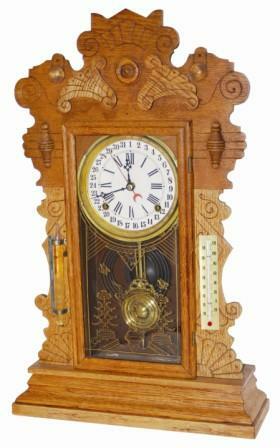 Waterbury Clock Co. oak calendar clock, shelf model, "Gibson", c 1912. Typical with this collectors clocks he cleaned the case and put a new paper dial on the pan. I believe the barometer is original and the thermometer is a replacement. The glass is original, there are two very good labels on the back, pendulum is the type they may have used, and the hands I cannot speak to. Large oak case is 24" high, and is complete and original, just dry. The collector was not one to put a stain, finish, or polish, back on the cases he cleaned. The movement is 8 day, half hour strike on a gong, and all parts appear to be functioning properly. Ly-Waterbury, No. 221.